Emiddio Giusti first appears in the Painesville, Ohio, area in 1900. 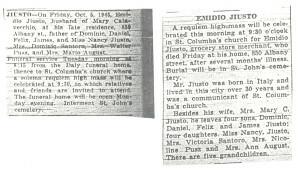 In America, Emiddio Giusti was known as Emidio Jiusto. Emiddio Giusti, son of Domenico Giusti and Emerenziana Scacciavillano, was born on March 30, 1875, at Frosolone, Italy. 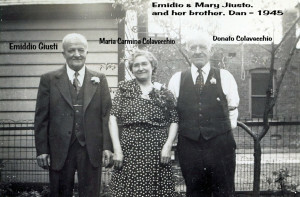 He married Maria Carmina Colavecchio, daughter of Nicola Colavecchio and Vittoria Carderelli, on November 14, 1907, at St. Mary Catholic Church at Painesville, Lake County, Ohio. 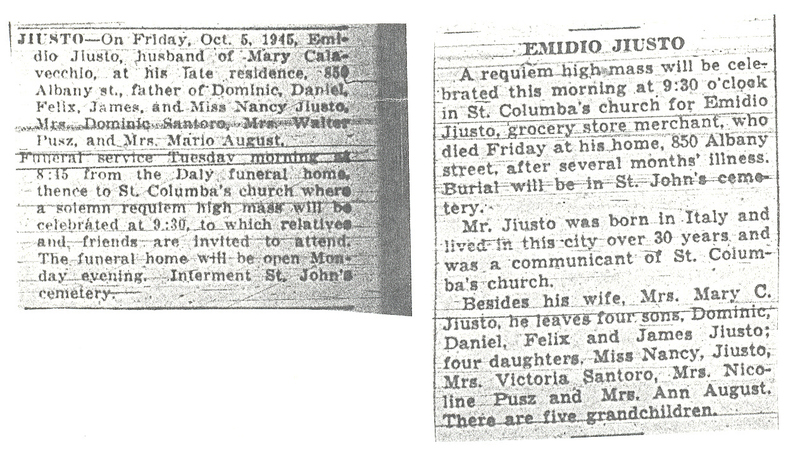 Emiddio died on October 5, 1945, at his home, 850 Albany Street, at Schenectady, Schenectady County, New York, at age 70. His body was interred at Saint John’s Cemetery at Schenectady, Schenectady County, New York. Emiddio Giusti, age 24, and his first cousin, Domenico Scacciavillani, immigrated to the United States on February 8, 1900, travelling to Painesville, Lake County, Ohio. He returned to Italy in 1904. Emiddio re-enters the United States on March 31, 1905, travelling to Painesville, Lake County, Ohio, joining his friend, Bartolomeo Colavecchio. His brother, Felicantonio Giusti, migrated to Painesville in 1901 or 1902. 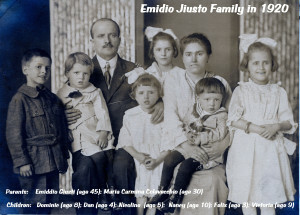 Emiddio and his family moved to Schenectady, New York, in 1913 or 1914. According to the 1910 census, while living in Painesville, Emiddio was employed as a laborer working for a railroad. In Schenectady, Emiddio was a grocer. 1. Nancy Rose Jiusto was born on May 23, 1910, at Painesville, Lake County, Ohio. Nancy died on December 21, 1977, at Schenectady, New York, at age 67. 2. Mary Victoria Jiusto, was born on August 21, 1911, at Painesville, Lake County, Ohio. She married Dominic Santoro in 1940. Victoria died in November, 1997, at Schenectady, New York, at age 86. 3. Dominic Jiusto was born on December 7, 1912, at Painesville, Lake County, Ohio. Dominic died in May, 1984, at Schenectady, New York, at age 71. His body was interred at Most Holy Redeemer Cemetery at Schenectady, New York. 4. Nicoline Jiusto was born on November 25, 1914, at Schenectady, New York. She married Walter Pusz in 1945. Nicoline died on November 12, 2001, at Schenectady, New York, at age 86. 5. Daniel J. Jiusto was born on December 17, 1915, at Schenectady, New York. Daniel died on August 23, 1994, at age 78. 6. Felix A. Jiusto was born on March 9, 1917, at Schenectady, New York. Felix died on September 15, 2004, at Schenectady, New York, at age 87. 7. Anna Jiusto was born on November 30, 1921, at Schenectady, New York. She married Mario August. 8. James E. Jiusto was born on April 5, 1929, at Schenectady, New York. He married Jeannette Hatch on July 28, 1952 at Chittenengo, New York. James died on October 5, 1983, at Guilderland, New York, at age 54. His body was interred at Prospect Hill Cemetery at Guilderland, New York.